Why Does Jesus Say He Is The Only Way To The Father? Today, it seems politically incorrect to say that Jesus Christ is the only way to the Father, so what do you tell others who don’t’ believe this? Jesus said, “I am the way, and the truth, and the life. No one comes to the Father except through me” (John 14:6), but what is the way? And what is the truth and the life Jesus spoke about? The early church was often called, “the way,” meaning, it was the way that Jesus taught, Who Himself said He was the way, the truth, and the life. Obviously, Jesus meant it is only through faith in Him that we have access to the Father in heaven, and “the life,” is eternal for all who believe (John 3:16). The early church suffered severe persecution, much at the hands of Saul, so Saul (later changed to Paul), sought “for letters to the synagogues at Damascus, so that if he found any belonging to the Way, men or women, he might bring them bound to Jerusalem” (Acts 9:2). Notice that “the Way” is capitalized. Early in the church’s history, it was known as the Way, but why is it called “the Way?” It’s because witnesses “proclaim to you the way of salvation” (Acts 16:17). Even though Paul was an Apostle sent to the Gentiles (to us! ), he still sought every opportunity to speak in the Jewish synagogues, and on one occasion, it was said that “some became stubborn and continued in unbelief, speaking evil of the Way before the congregation, he withdrew from them and took the disciples with him, reasoning daily in the hall of Tyrannus” (Acts 19:9), but regardless of where Paul preached the gospel, “there arose no little disturbance concerning the Way” (Acts 19:23), and Paul confesses, “I persecuted this Way to the death, binding and delivering to prison both men and women” (Acts 22:4), so the Way refers to the gospel of Jesus Christ…the only way to the Father. Jesus always spoke only that which was the will of the Father, and since God cannot lie, whatever the Father says through Christ is truth. Not “a” truth, but “the” truth! Just as Jesus is not one of many ways, He is the one and only way. It’s not politically correct to say that in public, but it’s correct, nonetheless because Jesus said it, and He is the truth. In speaking of the Word of God, Jesus said, “Sanctify them in the truth; your word is truth” (John 17:17), so God’s Word is the truth, but also note that the Word can sanctify them (and us). That’s the power of God’s Word (Isaiah 55:11; Rom 1:16; 1st Cor 1:18). Paul tells husbands, “love your wives, just as Christ loved the church and gave himself up for her to make her holy, cleansing her by the washing with water through the word” (Eph 5:25-26), and the washing that the Word does on us, and collectively, the church, is in order “to present her to himself as a radiant church, without stain or wrinkle or any other blemish, but holy and blameless” (Eph 5:27). God’s Word has power; it has power to save, power to sanctify, and power to make effectual change (2nd Cor 5:17). The longest book in the Bible (Psalm 119) is all about the Law of God, or the Word of God, so clearly God wants us to value His Word. God’s Word is law anyway, so as the psalmist writes, “The sum of your word is truth, and every one of your righteous rules endures forever” (Psalm 119:16), and so we conclude, “The law of the LORD is perfect, reviving the soul; the testimony of the LORD is sure, making wise the simple” (Psalm 19:7). In fact, Jesus is referred to as the Word of God (John 1). When you read the Word of God, you can know at least some of the mind of God, but only those who are born again can know the things of God, for “who knows a person’s thoughts except the spirit of that person, which is in him? So also no one comprehends the thoughts of God except the Spirit of God” (1st Cor 2:11). One of my very favorite memory verses is John 11:25-26, and these are verses that I think explain what He meant by saying He is the Way, the truth, and the life. Jesus told a heartbroken Martha, after her brother Lazarus had died four days earlier, “I am the resurrection and the life. Whoever believes in me, though he die, yet shall he live, and everyone who lives and believes in me shall never die. Do you believe this” (John 11:25-26), so Jesus is eternal life for all who believe (John 3:16), and death will not prevent them from seeing the Lord again. Death is not final, it is a beginning. Actually the very beginning of eternal life began at the moment God brought someone to repentance and faith in Christ. That newly birthed child of God then, already, has eternal life. Jesus is not speaking about a physical body…but an eternal life after death. The Apostle John equated Jesus as “the life,” in writing, “In him was life, and the life was the light of men” (John 1:4). If you want to focus on the part where Jesus is life, then read the gospel of John because it’s best by far since it contains 43 references to “life,” which is more than all the other gospels combined (35). Jesus gives every person a choice to make: “Whoever believes in the Son has eternal life; whoever does not obey the Son shall not see life, but the wrath of God remains on him” (John 3:36). So “life” is that which is eternal, and wrath is received in hell, but it’s also eternal, but more like an eternal death or dying (even destruction). When something’s destroyed, it doesn’t mean it ceases to exist. My old lawnmower is a great example. I pretty much destroyed it running over a brick hidden in the tall grass, but even though it’s destroyed, it still exists. It’s the same for those who reject Jesus Christ (John 3:36b). One life is eternal life in the presence of God, the other is the absence of the presence of God, although God is actually everywhere. It’s more of a separation from God, but tragically, it is for all eternity, without hope to change. Christians must not deviate from their stand on Jesus being the only way into the kingdom. Just be glad there is a way, and if someone criticizes you for that “narrow minded thinking,” tell them, “At least there is “a” way. Besides, this isn’t my opinion…this is straight from Jesus’ lips. 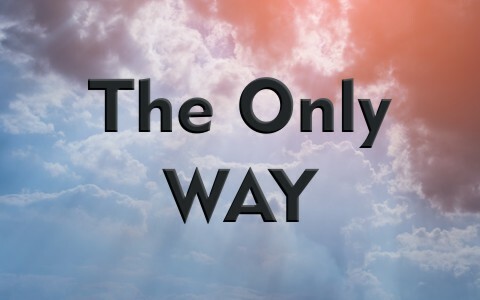 If you don’t believe He is the only Way, then you do not believe Jesus.” Jesus is the only Way, He is the Way, and there is no other name given to us by which we can be saved (Acts 4:12; 16:30). Here is a related article for you to read: Who is Jesus? Next post: When God Told Abraham to Go, Where Did He Travel?